CENTRAL POINT, Ore. – Following a trail blazed by Indians and pioneers in covered wagons, electric car drivers hit the road Friday to inaugurate the first major section of a West Coast “Electric Highway” dotted with stations where they can charge up in 20 minutes. The stretch of 160 miles of Interstate 5 served by eight stations marks the next big step in developing an infrastructure that until now has been limited primarily to chargers in homes and workplaces. The stations go from the California border north to the Oregon city of Cottage Grove and are located at gas stations, restaurants and motels just off the nation’s second-busiest interstate. One is at an inn that was once a stagecoach stop. Spaced about every 25 miles, the stations allow a Nissan Leaf with a range of about 70 miles to miss one and still make it to the next. Electric car drivers will be able to recharge in about 20 minutes on the fast chargers, which are free for now. “I would say range anxiety, with these fast chargers, will be nearly a non-issue for me,” said Justin Denley, who owns a Nissan Leaf and joined the caravan. Inspired by the stations, his family is planning a trip from Medford to Portland, a distance of about 280 miles. Last summer, he took the family on a 120-mile trip to the coast and had to include an overnight stop at an RV park to charge up. He expects the trip to Portland to take perhaps three hours longer than in a gas car, because the only chargers available for the last 100 miles are slower, level 2 chargers. Level 1 car chargers use 110 volts, like a regular home outlet, and it can take an entire night to charge a vehicle. Level 2 uses 240 volts, like a home dryer or range, and can charge a car in three or four hours. But Level 3, which uses 480 volts of direct current, makes en route charging feasible by boosting a Nissan Leaf’s 45-kilowatt battery from a 20 percent charge to 80 percent in less than 30 minutes. Bruce Sargent said he barely noticed the difference in his electric bill when he was using a Level 1 charger at home. When he installed a Level 2 charger, it went up about $15 a month, still far below what he was spending on gas. “For drivers to build confidence in driving hundreds of miles like they do in gas cars, they need an infrastructure,” said Wahid Nawabi, senior vice president of AeroVironment, Inc., the Monrovia, Calif., company that makes the stations. Interstate 5 stretches 1,350 miles from British Columbia to Baja California, Mexico. The section from Ashland to the Willamette Valley follows an ancient trail that was expanded by pioneers who blazed a southern branch of the Oregon Trail in the 1840s. The governors of Oregon, California and Washington signed an agreement to turn I-5 into an “electric highway” in 2009. Oregon made a deal with Nissan in 2010 to start installing charging stations if the company focused sales of electric cars in the state, said Art James, project leader for the state transportation department. The latest addition is financed by $915,000 in federal stimulus grants. 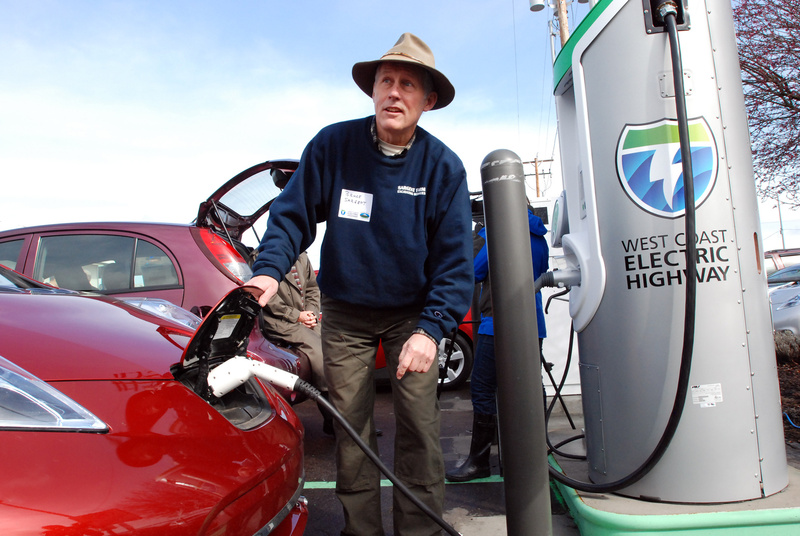 “That’s why Oregon is a leader,” with about 1,100 plug-in electric vehicles in the state, James said. By the end of this year, fast chargers will be installed along I-5 from Canada to the California border, a distance of about 550 miles. Another 22 are being installed as far away as 120 miles from Portland, Oregon’s largest city. The eight new charging stations each have a level 3 charger and a level 2 charger for backup. Drivers equipped with an electronic key fob can drive up and plug in around the clock. They get the fob when they sign up with AeroVironment’s charging program. Stations can be located with smartphones and software on the cars. The Interstate 5 stretch is not the first electric highway corridor in the country. That honor goes to Tennessee, where Cracker Barrel Old Country Store restaurants installed a network of charging stations last year along interstates connecting Nashville, Knoxville and Chattanooga, a total of 425 miles.